In Asakusa, there are famous “Sensoji” and many other temples and shrines. There are not only big ones but also small wonderful ones to get benefits. In this issue we will introduce “Hikan Inari” Shrine in the precinct of Asakusa Shrine next to Sensoji Temple. Let’s check out a shrine that is beneficial for your career advancement and employment. In 1854, when the wife of Tatsugoro Shinmon was seriously ill and in bed, he prayed to “Fushimi Inari” Shrine in Yamashiro (southern part of Kyoto Prefecture) for her recovery. The prayer worked and his wife got well. The people in Asakusa, in appreciation of her recovery, transported a double of the deity of “Fujimi Inari” Shrine to Asakusa. 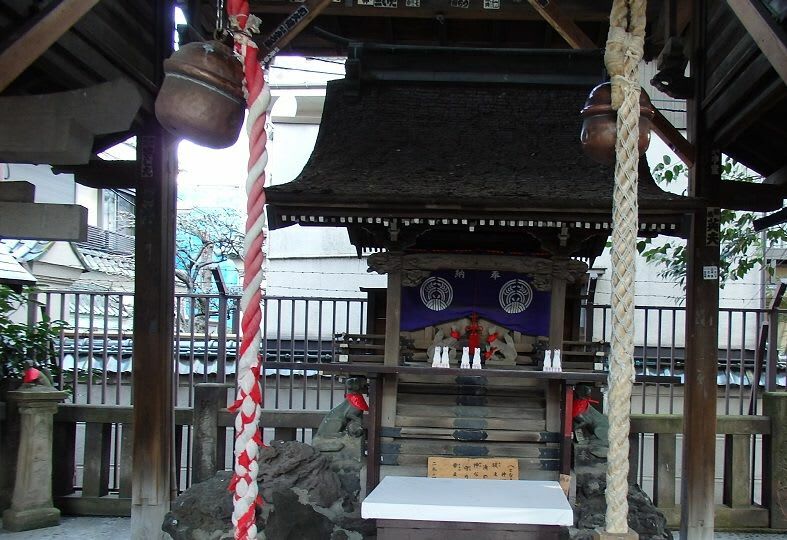 Later a small shrine was built as a subsidiary of “Asakusa” Shrine in its precinct. It is “Hikan Inari” Shrine. 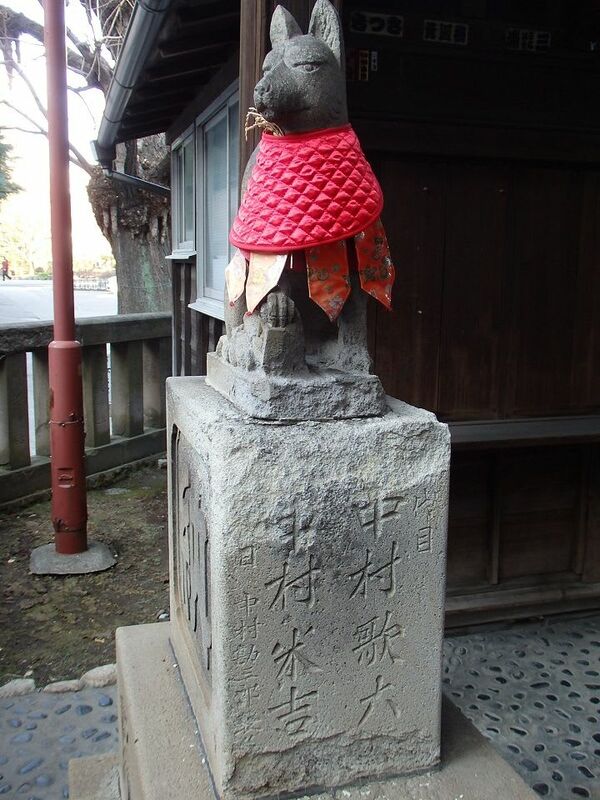 Usually there are “Komainu” (a guardian dog) in the precinct of shrines. In “Inari” Shrine however, there are foxes. Why? 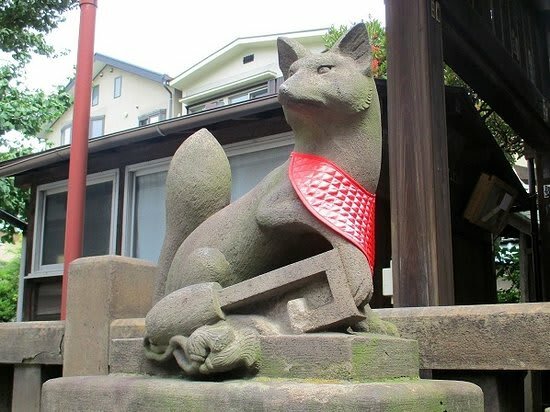 It is said that “Inari” shrines are god for agriculture and foxes catch rats which devour grains, and also the color of fox and its tail resemble rice ears. Hence the fox became a messenger of “Inari” God. Although the exact origin of the name “Hikan” is not known, it is probable that “Hikan” means “get a position” and accordingly “get a job” or “a prosperous career”. 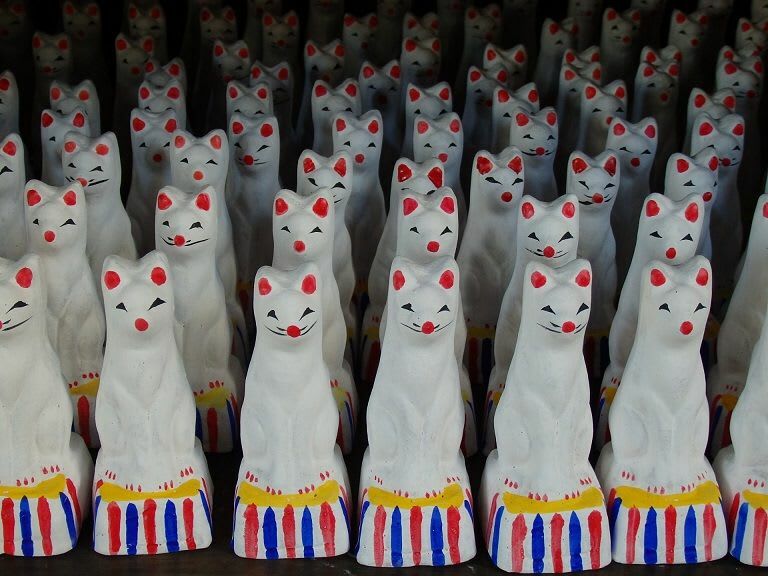 Therefore it is likely that “Hikan Inari” Shrine will grant you a good job or career. The front “Torii” (a gate of shrine) of “Hikan Inari” Shrine was donated by Tatsugoro Shinmon. The shrine was built in 1855. Its architectural style is called “Ikken Shanagare Dukuri”. The original shrine building has remained to-date since its inauguration. It has a thatched roof with cedar-bark, and is rather small with width of 1.5m in frontage and 1.4m in depth, and covered with a shelter. Foxe statues are everywhere in the Shrine. Many statues of fox, a messenger of God, small and large, are standing here and there. They are: parent foxes and kits, holding a key-shaped club, with a ball in the mouth, etc. It is fun to find your favorite one. “Ema” (a wood board) on which you write your wish, is also in the shape of fox. Check it out. On the back of the fox statue you find many names of “Kabuki” actors such as previous generations of “Kichiemon Nakamura”, “Tokizo Nakamura”, Utaroku Nakamura”, Yonekichi Nakamura”, etc. 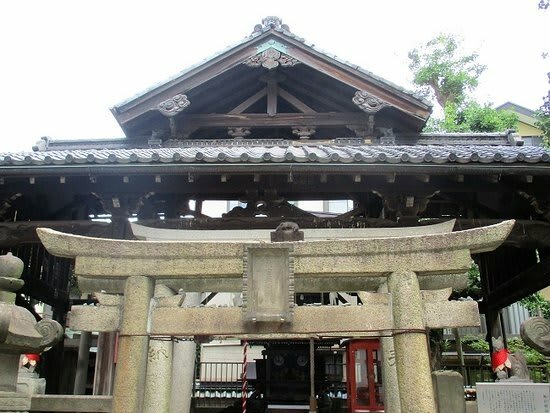 You will understand that “Hikan Inari” Shrine has been believed to be God of performing arts since the Taisho Period, because many popular actors made donations. ・Hours: Office 9:00a.m. – 4:30p.m.